Edwin was a prince of the Deiran Royal family from Yorkshire, the eldest son of King Aelle. After his father's death in AD 588, the kingdom was annexed by the armies of King Aethelfrith from adjoining Bernicia, Edwin was forced to flee and he "wandered secretly as a fugitive through many places and kingdoms". He was still a boy when tradition has him initially seeking sanctuary at the court of King Iago of Gwynedd. Here he must have grown up alongside the King's sons (an impossible legend says grandsons) and became a particular rival of his foster-nephew, Prince Cadwallon. He may also have spent some time at the Mercian Court. These people were the natural allies of the Northern Welsh and it seems to have been around this time that Edwin married Princess Cwenburga, daughter of King Ceorl of Mercia. They soon had two children, Osfrith and Edfrith. With Aethelfirth now secure in the North, in AD 613, he decided to try and root out Edwin from Wales. The two forces clashed at the Battles of Chester and Bangor-on-Dee. King Iago of Gwynedd and a number of other British monarchs were killed in the fighting and Edwin felt it best to move his family to the court of the Saxon Bretwalda, King Redwald of East Anglia, in order to protect Cadfan, the new King of Gwynedd, from further attacks. Aethelfrith sent envoys to Redwald with bribes and threats and the mighty monarch was sorely tempted to give Edwin up to his enemies. However, the Queen persuaded Redwald that this would be shameful in the extreme. So, instead, in AD 616, the two raised an army and marched North to engage the Bernicians on the banks of the River Idle. The Northern army was thoroughly defeated and its King killed. Edwin immediately pressed forward his advantage and overran Bernicia as well as his own homeland of Deira. Aethelfrith's sons (including Princes Enfrith, Oswald and Oswiu) fled to exile in Gododdin and Scottish Dalriada. The following year, the new monarch of a united Northumbria decided to enlarge his kingdom still further by conquering the British Kingdom of Elmet, and slaying King Ceretic in the process. His armies also moved into Strathclyde and Gododdin looking for Aethlefrith's eldest son, Enfrith, who was obliged to move northwards into Pictland. It was almost certainly also Edwin's armies which overran South Rheged and forced King Llywarch Hen and his family to flee to Powys. It was supposedly during this conquest period that he came into contact with the Royal House of North Rheged and was baptized into the Christian faith by Prince Rhun. However, he must have lapsed back into paganism soon afterward for, in AD 625, Edwin married - traditionally on the site of St. Gregory's Church, Kirknewton - the Princess Ethelburga sister of King Edbald of Kent and, though he welcomed her personal chaplain, St. Paulinus, as Archbishop of York, Edwin himself was a still pagan. It seems that Edwin's Mercian wife had been put aside for no other reason than political expediency. This, no doubt, led to much bad-feeling in Mercia and the lady's cousin, King Penda, seems to have allied himself with the kingdom of Wessex around this time. In AD 626, Prince Cwichelm of Wessex sent an assassin north to murder Edwin. He was, however, saved from being stabbed by the timely intervention of one of his thanes. By co-incidence, Edwin's daughter, Enflaed, was born that same night and it is said that the King promised to give her to St. Paulinus for baptism, if he was victorious over the assassin's paymaster. Discovering Cwichelm's treachery, Edwin marched on Wessex. Prince Cwichelm and his father, King Cynegils of Wessex, marched north to meet the Northumbrians at the Battle of Win Hill & Lose Hill (Derbys), probably with the aid of King Penda. Despite their army's superior numbers, the Wessex duo were defeated and fled south once more. Edwin, of course, kept his promise to St. Paulinus. Following his victory over Wessex, Edwin may have even been acknowledged as overlord of all the Anglo-Saxon Kingdoms (save for Kent). Bede certainly records that Edwin held imperium south of the Humber. Soon afterward, he decided to extend his overlordship still further into more British kingdoms. With a substantial fleet at his disposal, Edwin conquered the Isle of Man, forcing King Anllech to flee, before moving on to Gwynedd. His old foster-brother, King Cadfan, had recently died and Edwin seems to have been determined to put his old rivalry with Cadwallon to bed once and for all. The Northumbrian King conquered Anglesey and besieged his foster-nephew on Puffin Island before finally forcing him to flee to Brittany. Edwin then began to consolidate his position. At the Royal Court in Yeavering, he allowed Paulinus to convert him to Christianity once more. The King then travelled to York for baptism in Paulinus' proto-Cathedral and persuaded all his nobles, as well as sub-Kings (such as King Eorpwald of East Anglia) to follow suit: thus ensuring unity within the country. It was a prestigious move which brought letters and gifts from the Pope in Rome. Edwin also set about re-fortifying York and the famous 'Anglian Tower' may date from this time. Though this city might be considered Edwin's capital, he held a number of important administrative centres and resided in them on a circuit basis similar to that used by later Saxon and Norman Kings. The most important were Yeavering in Bernicia, York and Catterick in Deira and Campoduno (near Doncaster) in Elmet. Bede describes how Edwin would travel around, preceded by a standard bearer "as he rode among his cities, estates and kingdoms with his thegns. Further, when he walked anywhere along the roads, there used to be carried before him the type of standard which the Romans call a tufa and the English call a thuf." Such peaceful times were not to last however. Trouble was brewing. King Cadwallon of Gwynedd soon returned from the Continent looking for revenge. In AD 633, he marched a great British army into the North and clashed with the Northumbrians at Hatfield Chase. 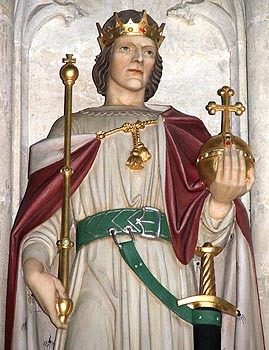 King Edwin was killed in the fighting at Edwinstowe (Notts) and the victorious Cadwallon went on to decimate his country. Edwin's supporters managed to take his body for burial in the Royal Abbey of Whitby. He was later revered as a saint, and his head was translated to York Minster. The King's family, however, fled to Kent and the kingdom was nominally divided between Enfrith of Bernicia and Osric of Deira.